Russian interference took many forms. It wasn’t just pro-Trump, and they actually played both sides, having pages devoted, for example, to promoting “Black Lives Matter” as well as “Blue Lives Matter,” pro-Trump groups and “resisters.” Certainly, getting Trump elected was one goal, but a wider aim was to cause distrust, and almost any cultural sphere was used: issues of race, immigration, law and order, and even health. In total, more than 290,000 accounts followed at least one of these Pages, the earliest of which was created in March 2017. The latest was created in May 2018. The most followed Facebook Pages were “Aztlan Warriors,” “Black Elevation,” “Mindful Being,” and “Resisters.” The remaining Pages had between zero and 10 followers, and the Instagram accounts had zero followers. The two images above are from a New York Times article on the posts these fake pages generated. 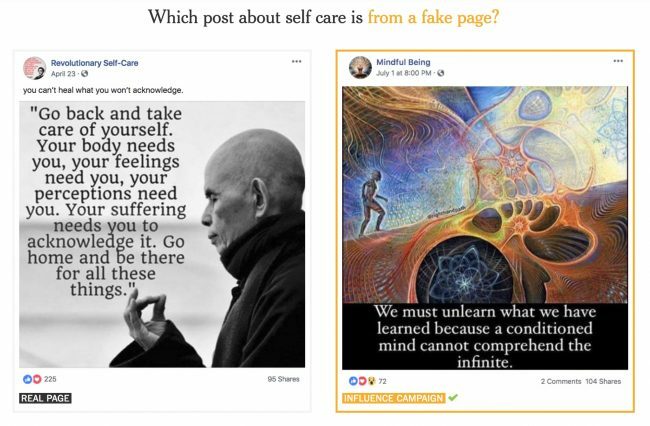 The article is in the form of a short quiz, asking you to choose which of two paired posts was from a deceptive Facebook page. I’d recommend taking the quiz to test your discriminative abilities and to learn more about what Russia has been up to. 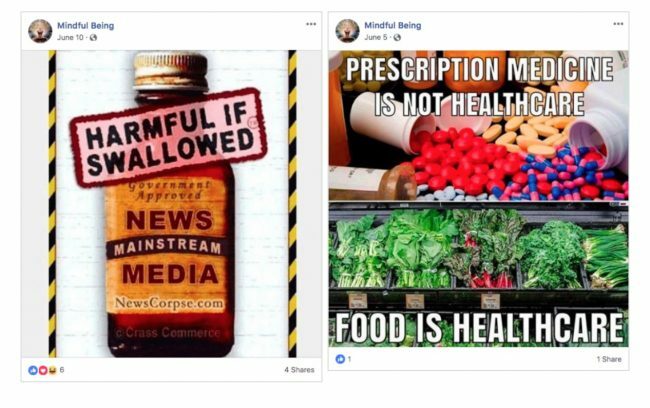 You can see how it’s possible to draw people in by using innocuous “inspirational” content, and then to segue from that to posts that are designed to make people distrustful of the news media and of science. There’s a bit of a connection here to one of my side-projects, which is my Fake Buddha Quote blog. For one thing, the same critical skills that are involved in determining whether a quote is recent or from India 2,500 years ago can help with questioning whether a Facebook meme is designed to manipulate you. In fact I talk about the spiritual practice of verifying quotes (any by extension memes and news stories) in the conclusion to the book, which is called “I Can’t Believe It’s Not Buddha.” I don’t want to sound too commercial, but the book is available for preorder (and it’s readable, interesting and funny). I came across your site and the article about “weaponized mindfulness”, and figured you might be interested in how I got here: I was reading around and watching some YouTube video-lectures, trying to learn more about the neuroscience related to meditation. There’s of course plenty of material about this. I felt sometimes uncomfortable about the vagueness in use of words like “mindfulness”, “altruism”, “kindness”, etc in connection with science. This vagueness has never been a real problem for me and others until rather recently, when there are more and more attempts finding quantitative assessments of such complex categories, and presenting it as rigorous science. I look at this through the eyes of someone a bit old-school, trained in science (physics, computer science, some knowledge of neuroscience, applied to earlier research in human speech production and later to speech technology). I think usually there are the best intentions behind research that tries to make connections between meditation and mindfulness on one hand and certain observables on the other, for example, physiological measurements, and other physically measurable correlates of human expression and behavior. These measurements are often obtained by fMRI or by surface electrodes, but also by indirect means as observations about motor behavior and facial expression. The intention behind such research is often motivated by looking for better ways of treatments of mental illnesses, towards healing methods for stress related health conditions, or among many others, for ADHD treatment (that I might benefit from). All this is nice and dandy and I’m usually in favor. What I find problematic though is a certain simplistic belief in the predominance of quantifiable measures to assess success or failure of the research. I am not at all saying that these requirements should be weakened – what bothers me is that too many categories of human thought and belief, which could often at best be characterized as meta-physical categories, are increasingly connected with quantitative representations. For instance, it makes me cringe if I find diagrams with some data plus error bars where the vertical axis is labeled with a word like “compassion”. The real issue seems to me that people have given in to a simplicistic ideology that everything that uses numbers and some math is scientific, and therefore worthy of funding. It bothers me the rather deep concept of measurement (in physics) got so naively expanded to whatever people want to talk about in their bullet point presentation of “scientific findings and results”. IMO, this throws out more and more a necessary deeper debate about principles, and replaces it by more simplistic empiricism. This is also directly connected to the fact that computer science is invading everything else: Once you have a method to connect abstract concepts with a numerical scale, it gives rise to the superficial thinking that the abstract concept was in some way equivalent to a number on some scale. Suddenly things that nobody would usually think of comparing quantitatively, like apples and oranges, become mapped on ordered sets. And suddenly it seem possible to rate and rank-order human expression and behavior on all kinds of barely validated and often invented scales: more or less intelligent, more or less kind, more or less aggressive, more or less mindful, etc. Putting a number to these complex categories is a bit like using pixi-dust to turn something of some very complex and mostly subjective nature into something apparently objective and measurable, like body weight or hat size. I think that in the long run this could hurt both science and culture. The possible abuses for “cultural engineering” worry me even more than obvious manipulations for political gains. The manipulative websites you described in your article are part of that. Here is how I came across your webpage: While thinking about “mindfulness” I came up with a contrarian question: What could mindfulness mean for a fighter pilot while doing a bombing raid? I know, that is a shocking idea. Next: Could military institutions such as the Pentagon get into research-funding for methods that, for example, makes a pilot more mindful while at the same time enabling him or her to suppress the amygdala response to the evidence of observed human suffering – this is weaponized mindfulness to carry out the bombing raid with more precision and more effect. And then I thought, someone must have already thought about this. Of course, i didn’t catch the Pentagon, they wouldn’t talk about it. But there is other ways: take the now increasing number of meditation apps for mindfulness, already used by many (including myself) and promoted by Apple and others. Combine this with the increasing attempts at surveillance and censorship of the social media in the West for a few good and many bad reasons. To name a really bad example, consider China’s new Big Brother under construction, their called social credit system. It is a big bait and switch system to reward and punish people based on almost universal surveillance and data collection of minute details of human interactions, all the way to one’s heart rate and workout-out time assessed by some wellness app and device. Use the meditation app often enough, and you might get some browny points to improve your social credit score, which raises your chance to get a bank loan at low interest. Uninstall all those mindful meditation apps in a moment of anger, buy some liquor or get caught at j-walking by a CCTV camera with face recognition – and there goes your credit score. With all this in mind, I typed in the google search “weaponized mindfulness”, and your page showed up. I liked your article very much, even though I don’t agree that we got the orange blob in the highest office because of Russia-gate. I have the feeling that we haven’t seen anything yet. If Trump loses the midterm election the GOP might retaliate and blaim it on a purported or actual China-gate. Maybe we should worry about mindfulness meditation spam robots next?